Please read my weekly outlook for the markets here. 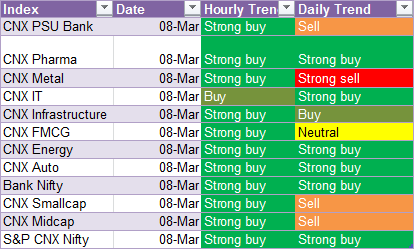 All Sectors except PSU Bank, Metals and FMCG have become a buy in daily charts. 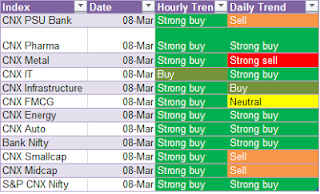 All sectors are in buy mode in hourly charts. On 11 March, I will have the following stocks in my watch list. 1. ICICI Bank. Buy above 1145 for a target of 1150. On crossing 1150, the stock could move up to 1163 levels. 1130 is the SL for all longs. 2. SBI – Buy above 2220 for a target of 2230 and above. If SBI sustains above the significant resistance of 2230, then 2260 is possible in coming days. 2200 is the SL for all longs. 3. L&T – Above 1500, 1524 is the target. SL for long is 1490. 4. Cipla – Above 393, 395, 397, 398 are the targets for today and next 2-3 days. SL is 389 is sustained below. 5. ONGC – Above 328, 331 is possible. Once long, maintain SL as 324.50. Wish you a profitable trading day. Readers, there is a negative news on L&T. Better to avoid longs even if levels are met.